Cardiovascular disease is the leading cause of death in the United States. The American Heart Association estimates that more than 71 million Americans, or one in five people in this country, have one or more types of cardiovascular disease. 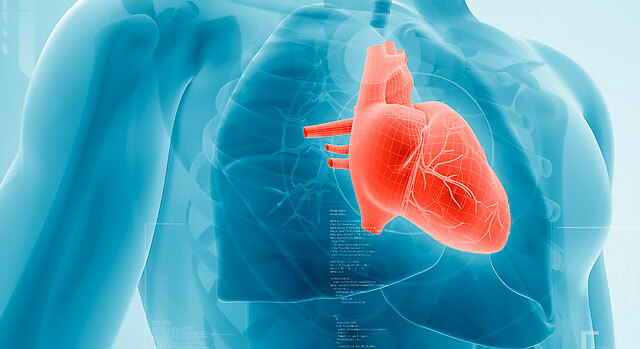 Some common types of cardiovascular disease are high blood pressure, coronary heart disease, stroke, rheumatic heart disease, congenital cardiovascular defects and congestive heart failure. Cardiac Catheterization Lab — Radiological equipment and dyes are injected into arteries to diagnose and treat heart disease. Interventional tools such as balloons and stents are fed through a catheter into the coronary arteries to reduce stenosis, the narrowing of blood vessels, and increase blood flow. Echocardiography — Uses ultrasound waves to produce accurate images of the heart in action, allowing cardiologists to evaluate the heart's performance, its chambers and valves. Electroencephalogram (EEG) — Monitors the brain's electrical activity to help diagnose strokes, seizures and other conditions. Electrocardiogram (EKG) — Traces electro-activity in the heart to help diagnose cardiac problems. Pacemaker Analysis — Tests the functioning capacity of implanted pacemakers. Treadmill Exercise Stress Testing — Measures the heart's performance while under the stress of physical activity. Ultrasound with Doppler — Tracks changes in a patient's cardiac output and fluid volume, which are critical indicators of how well the heart is transporting blood and oxygen to the organs. Patients who need interventional cardiac procedures or open-heart surgery can find advanced cardiac care in one convenient location at The Heart Center. Summerlin Hospital's Cardiovascular Care Unit is a 28-bed unit featuring private rooms and an emphasis on patient comfort. Patients stay in the same room for their entire hospital stay, while the hospital staff adjusts the level of care it provides to meet the patient's changing needs. Arrhythmia, or abnormal rhythms of the heart, can signal a cardiovascular problem. Advanced treatment for arrhythmia is available in Summerlin Hospital's electrophysiology (EP) laboratory, where cardiac specialists evaluate and treat patients who have heart rhythm disturbances. EP studies can help physicians identify the types and locations of arrhythmias. Radiofrequency ablation procedures, also performed in the lab, can help interrupt faulty electrical signals in the heart. Summerlin Hospital's EP lab also offers three-dimensional cardiac mapping to provide precise mapping of cardiac rhythm problems. This technology is beneficial for patients who have complex heart rhythm problems. Following a cardiac procedure, patients may receive care in our Cardiovascular Care Unit, a dedicated unit for the care of patients with cardiac conditions. The Chest Pain Center at Summerlin Hospital Medical Center is here to evaluate and treat patients with cardiac-related chest pain. The Chest Pain Center has been certified by the Society of Cardiovascular Patient Care as an accredited chest pain center with percutaneous coronary intervention (PCI). PCI includes procedures that treat patients who have partially or completely restricted blood flow through an artery of the heart. Among those procedures are balloon angioplasty and stents. PCI is only available at approximately 25 percent of hospitals in the United States. The Society of Cardiovascular Patient Care's goal is to reduce mortality from heart attacks by teaching the public to recognize and react to the early symptoms of a heart attack and to reduce the time that it takes to receive treatment.